Windows team announced Windows Product Scout launched last night. These products are enhanced by Windows 7 technology. The products featured on the site are limited to an intentionally selected catalog. Every week, a new set of products will be featured on the home page and site will be updated every month with more selected products. These products have passed Microsoft designed tests for compatibility and reliability with Windows 7 including testing for common issues to minimize the number of crashes, hangs and reboots. For launch Microsoft is introducing 58 products including a range of apps. 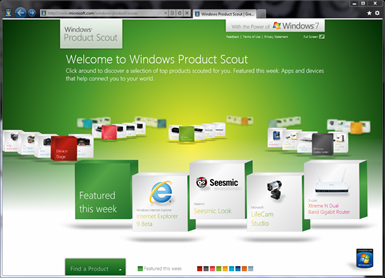 The Windows Product Scout enhance Connect & Communicate, Media & Entertainment, Photos & Creativity, Printing & Productivity and much more.